Munio is simple tower defense from RetroFlashGames.com. Simple game with an average playability. Basic Turret is the basic weapon with good rate, but with low damage. Laser Turret is very good weapon with excellent range. You can set up damage balance for each kind of enemies. EMP Turret has no damage but it can slow enemies. Inferno Turret has good range and it attacks enemies with splash damage. Sonic Turret is weapon with low range. It sends sound impulses to enemies in the range. C&C Node has no damage. But it increases damage of all weapons in the range. It is very useful facility. You can upgrade all turrets more times. They can also be sold. Munio has simple game engine. It has poor graphics and weak sound effects. All controls in the game are clear. Playability of the game is not bad, nut it is sometimes a little bit easy. 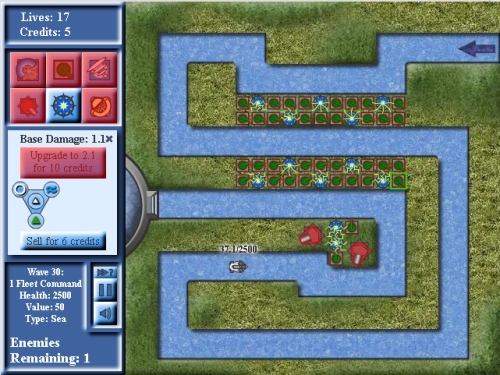 Munio is simple tower defense game with good playability. I can recommend this game for TD beginners. My valuation for this game is 5.0 points from 10.